Are you craving for something really sweet and yummi? Why don’t you try a gorgeous Italian “dolce al cucchiaio” for a special meal? 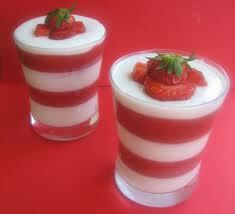 Here is for you the real Panna cotta’s recipe! Interested? The following recipe is really easy and quick to prepare: ca. 10 minutes for the preparation and 5 minutes for the cooking time. Panna cotta is probably one of the most famous and appreciate amongst the category of the wonderful Italian spoon desserts. You can find it in every bar or restaurant in Italy! And also it is well-known and spread in many other European countries. This dessert exists in many forms and, according to its fame, you can find many versions on the Web. Here is a couple of recipe for our beloved panna cotta, flavoured in different ways. For four people, you will need the following ingredients: a pint of double cream, a few drops of vanilla extract, 3 ½ oz of sugar, 1 tbs of instant coffee or fuse chocolate, ½ fl oz of dark rum or brandy, 2 leaves gelatine leaves, cocoa powder for dusting. First step: soak the gelatine leaves in a small bowl filled with cold water and set aside. Second step: pour the cream into a small pan and turn the heat on very gently. Slowly, add the vanilla extract, then the sugar, then the instant coffee or some chocolate drops. Or just leave it as it is. It could be a gorgeous vanilla basic panna cotta to top with jam or liquid chocolate!! Back to the recipe, now! Third step: you can add the rum or the brandy and stir gently for a few minutes. The cream will get thicker and thicker slowly, so never let it boil. Remove the pan from the heat, squeeze the gelatine leaves and put it in the pan. Stir gently until the gelatine is completely mixed into the cream. Put it into 4 glasses or into 4 mugs and then leave it on the table to chill. Everything should go then in the fridge, in order to set properly. Leave it about 4-6 hours in the cold and now it is ready! As a final touch, before serving, you can dust the panna cotta with some cocoa powder or, if you have decided not to put the coffee in the preparation, just add on the top a bit of blackberry jam or chocolate topping…delicious! This entry was posted on Thursday, April 14th, 2011 at 2:56 pm	and is filed under Italian Recipes and Food. You can follow any responses to this entry through the RSS 2.0 feed. You can leave a response, or trackback from your own site.